Making Egyptian mummies, Hebrew love making and girding the loins before battle in Ancient Greece are just some of the historical uses of garlic. I prefer to keep mine for use in the kitchen, garden, and for my pets and poultry. It's medicinal virtues are well known, principally used for it's natural antibiotic properties. Best used raw, swallow it in small pieces, or to kick a chronic ear infection cut to size as ear plugs and wrap in a small square of tissue before inserting in the ears at bed time. Feed it to your pets for a natural insect repellant and immune booster. Add it to stir-frys, bread, soups, caseroles... just about anything, it's flavour will reward. In the garden it can be used to repel pests. Combine three large crushed cloves, one tablespoon of vegetable oil, 1 litre of water and 1 teaspoon of natural liquid soap. Soak overnight, strain and spray. 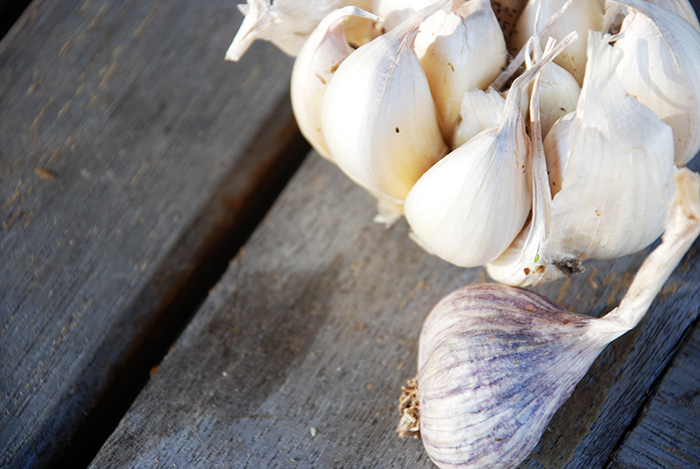 Sure to reward gardeners of any skill, garlic is easy to grow. Autumn is the best time for planting this versatile plant in warm temperate to tropical regions. Wait until late Winter, early Spring in cooler regions. Choose a full sun position, somewhere that will catch the eye when their beautiful purple pom pom blooms come out. Work in some compost into a well drained soil. Make sure the soil PH sits above 6.5 by adding some dolomite lime. We purchase organic garlic from our local organic supermarket and wait till it starts to sprout green shoots before planting. This usually happens with the garlic we intended on eating, so at this time of year, eat your garlic quickly! Some online seed suppliers stock seed garlic bulbs. This year we found a garlic grower at our local farmers market. We purchased their 'Stroud Purple' garlic, their own variety, and some miniature garlic bulbs. Plant the bulbs pointy end up in the soil and keep moist till flowers appear. Ease off on the watering to allow the bulbs to develop their characteristic dried skin. At this point you can sneak a few early bulbs to eat as 'wet garlic'. This is garlic harvested before the skins dry. It won't keep, but it will be hard not to eat it straight away as this milder juicy form of garlic makes a tasty addition sliced fresh in salads. Harvest when the tops die down, in about four months. Leave on the dried stems as these can be used to plait the garlic. I'll include a step by step here on the blog when ours mature. Be sure you plant plenty of garlic as the plaits make fantastic presents!